The recent soap challenges hosted by Amy Warden of Great Cakes Soapworks were such a success that she created a monthly Soap Challenge Club. In order to participate, soapmakers must become members of the club and pay a nominal fee to enter each challenge. And the reward? Well, besides the chance to hone your soapmaking skills and learn new techniques, there’s a prize. 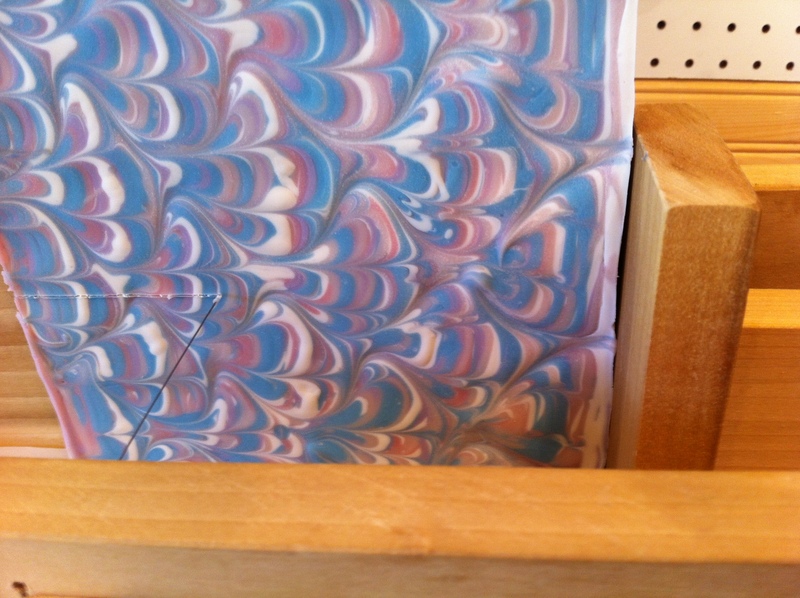 Not just any old prize, though; this month it’s an 18-bar slab mold with silicone liner generously provided by Bramble Berry® Soap Making Supplies! (Someone’s going to be very happy). This month’s challenge is the peacock swirl. 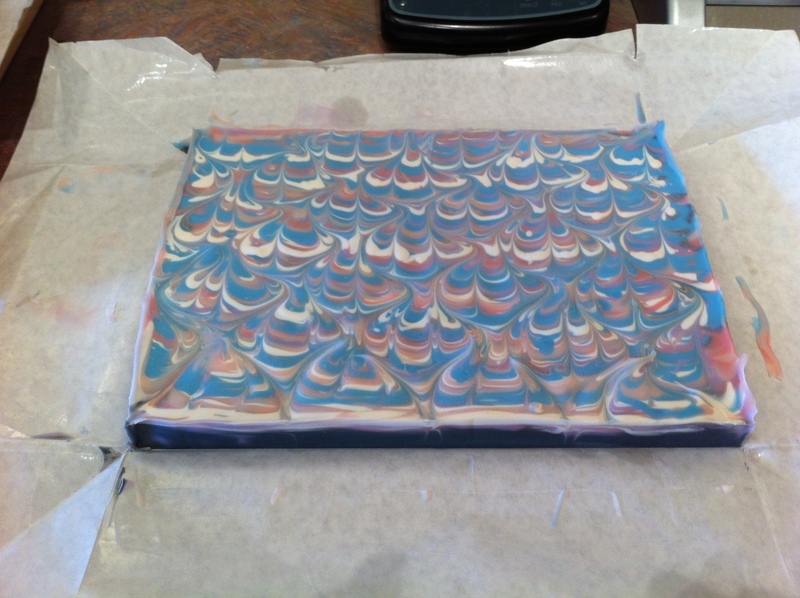 I’ve tried this technique only once before, and it didn’t turn out particularly well because the soap batter was too thick to create the fluid lines needed to create the complex design. 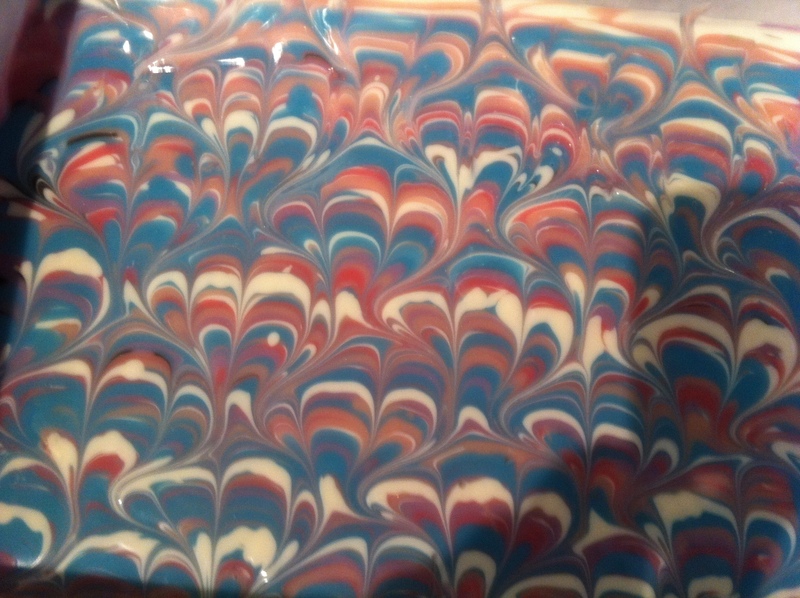 So I chose a slow-moving recipe to give myself plenty of time to work, and I designed a midnight black soap with vibrant electric blue and purples, deep rose and pastel pinks, and white swirls. 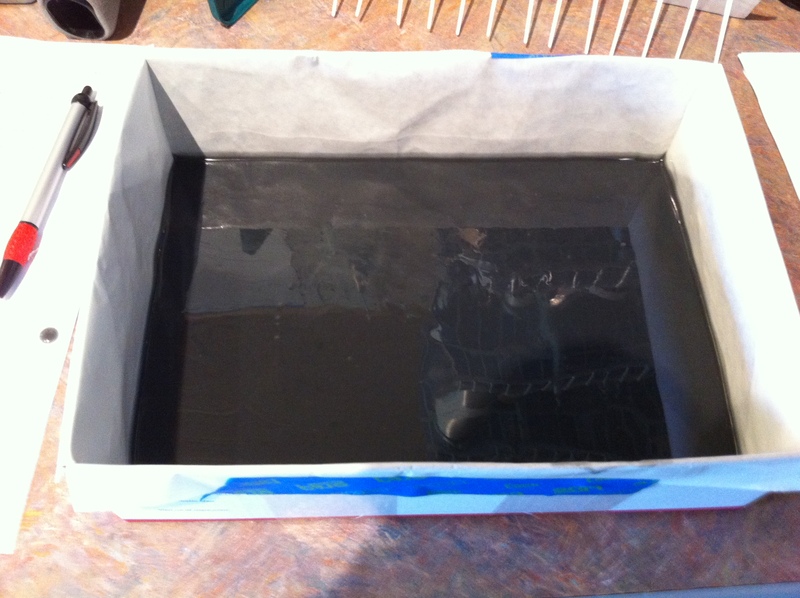 Since I only wanted to create a small batch – in case of an epic fail – I created a small slab mold from a cut-down cardboard box, and lined it with butcher paper. The “comb” you see is also homemade, and it’s used to create the first part of the design. Then I gathered my materials. 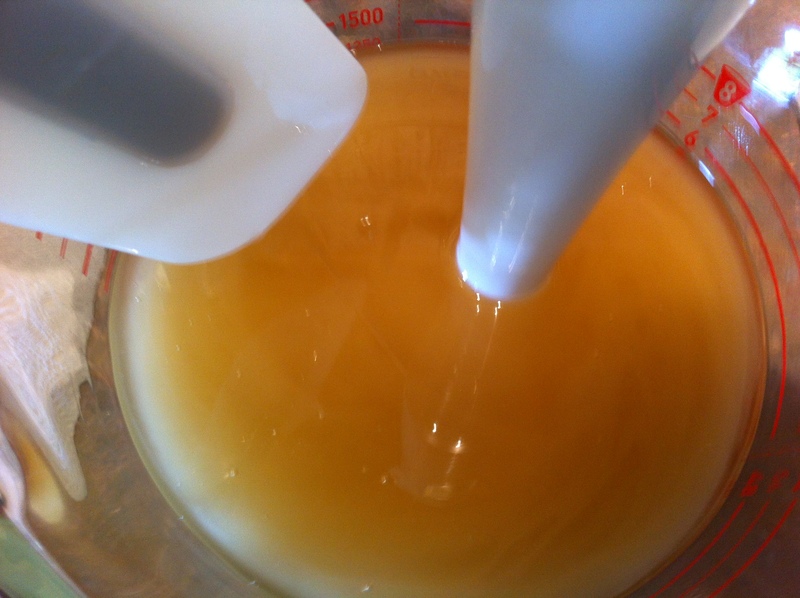 Bamboo charcoal, four micas, and oil-soluble titanium dioxide (a whitener) were mixed with just a bit of the liquid oils from my recipe. My essential oil blend of sweet peppermint and sharp tea tree stood ready to add a surprisingly pleasant wake-up zing. My oils were weighed out and ready for the lye solution. 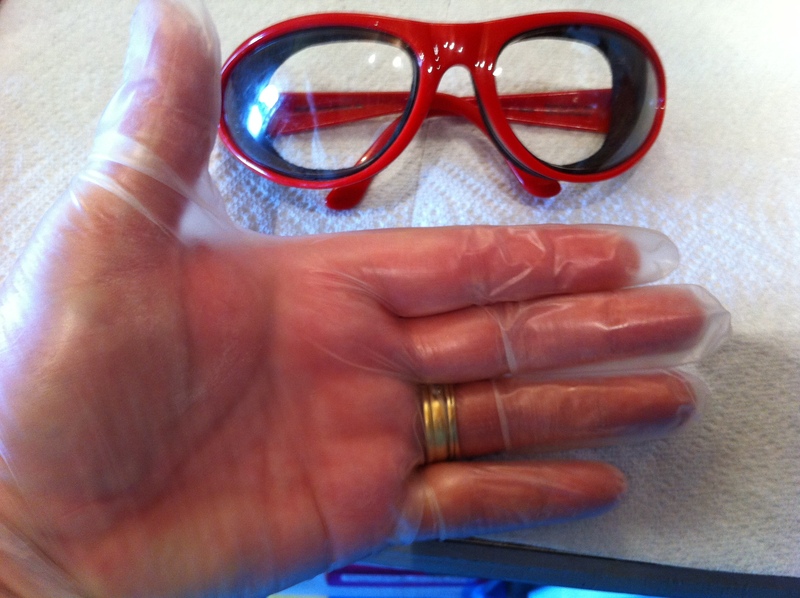 As always, safety first – gloves and safety goggles are a must when working with lye. Ready to begin! 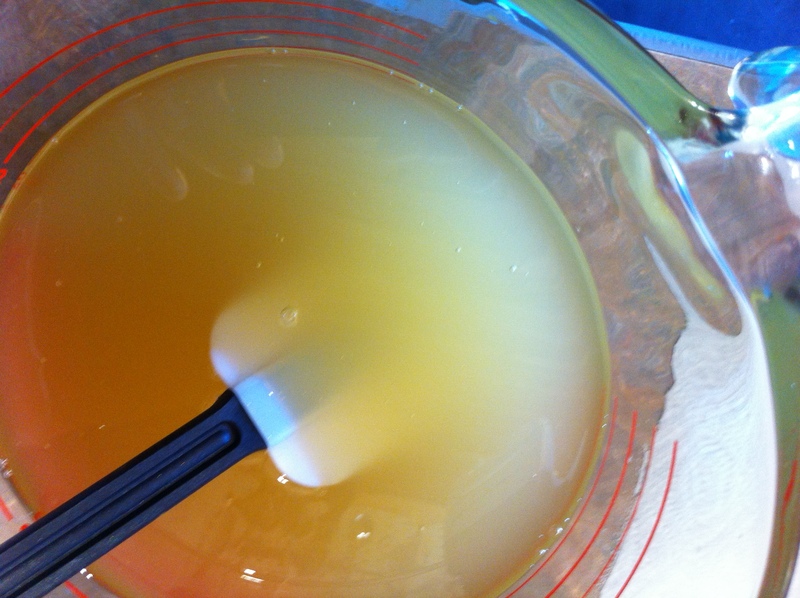 The essential oils were added to the oils and stirred a bit, the lye was slowly added, then stick blended (see the color change)? 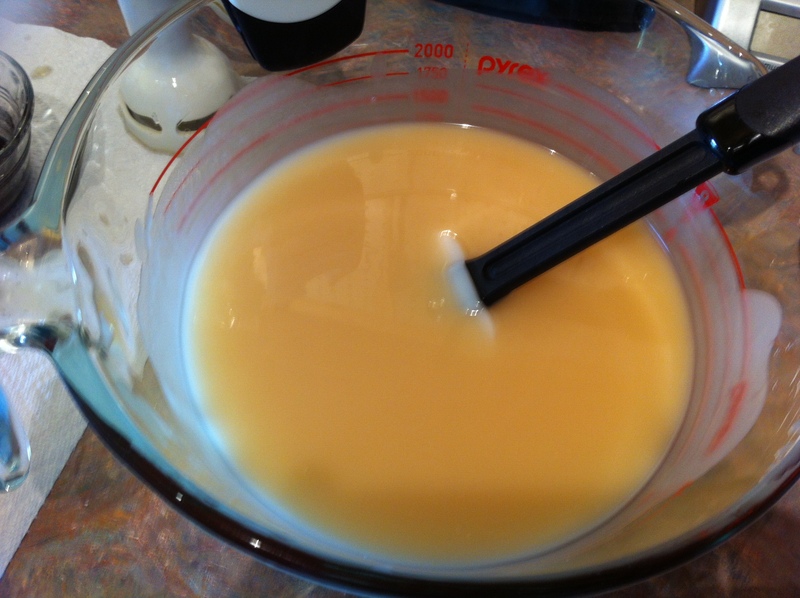 I didn’t want the soap too thick, so I only blended until the batter was emulsified. Some of the batter was poured into each of the pre-mixed colorants, and the bamboo charcoal was added to the batter remaining in my bowl. This was my base color, so into the mold it went. Now for the fun part! 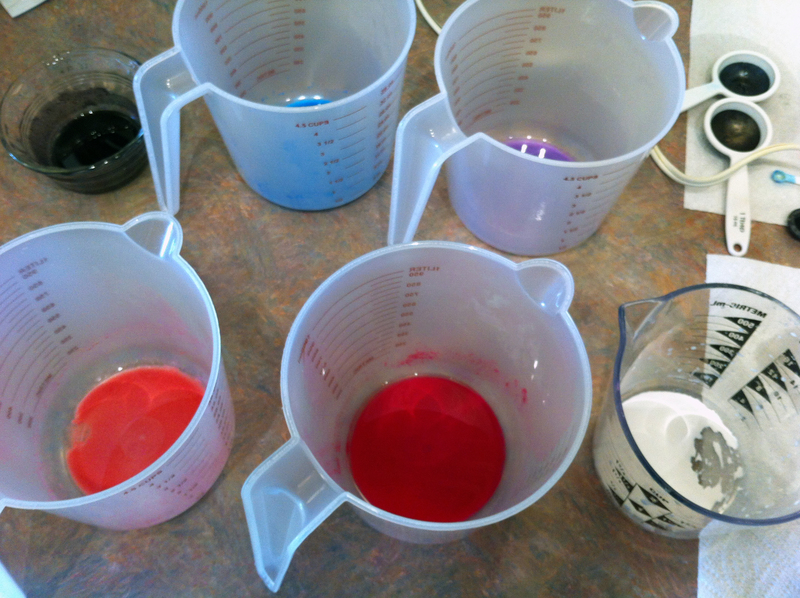 I gave the colors a quick stir with my mini-frother (love that thing!) and decided at the last minute to pour them into squeeze bottles. 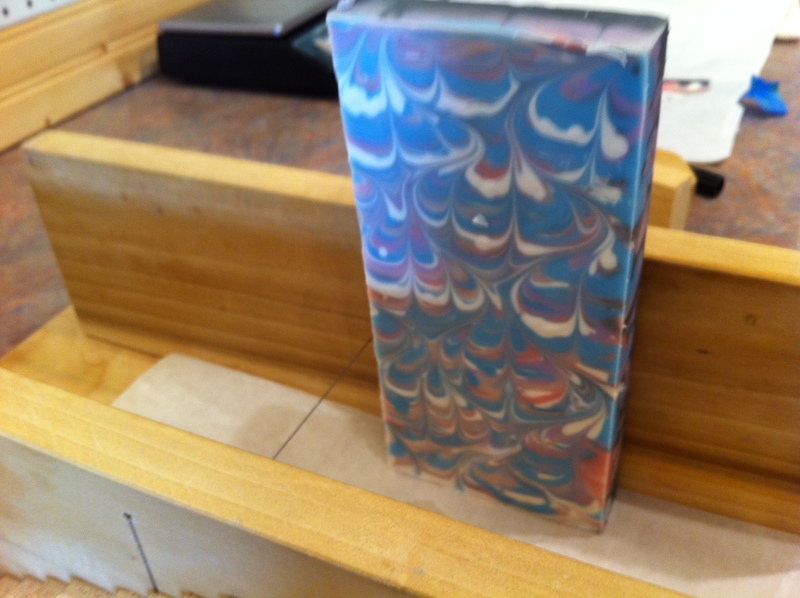 Then alternate stripes of color were added to the width of the mold until all the colors were used up. Remember the “comb”? 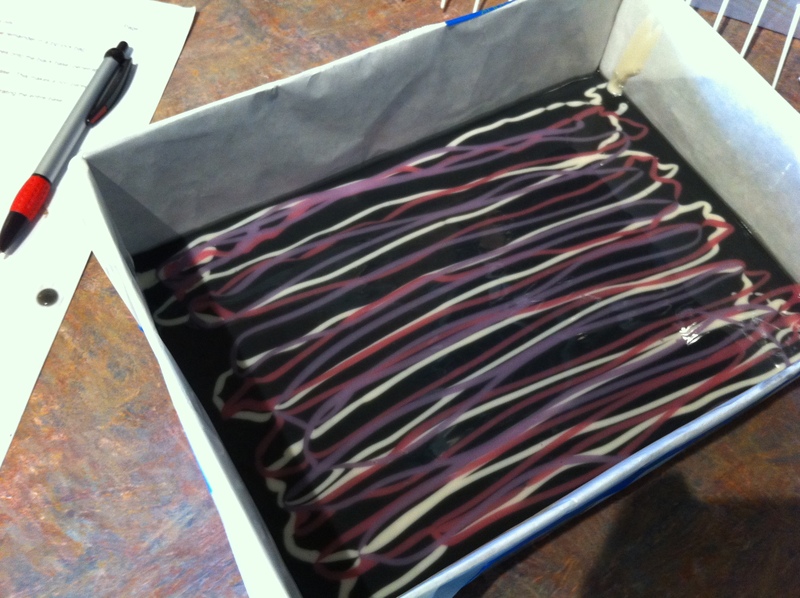 Dragging it top to bottom through the stripes created a swirl of its own, called a non-pareil swirl. It would be pretty if left like this, but the challenge was the peacock swirl, so on to the next step. For some reason, it helped to think of drawing balloons as I used my chopstick to create a wavy pattern on top of the non-pareil swirl. Finished! 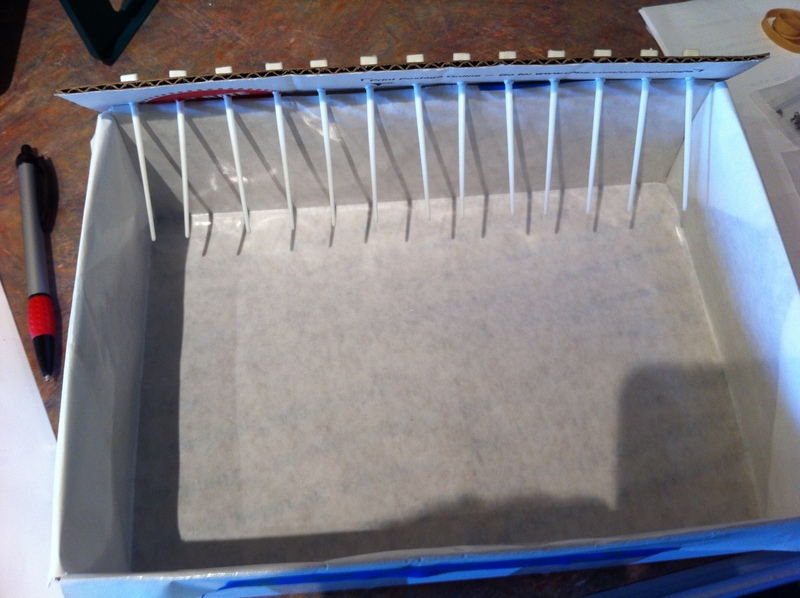 After setting up for a day, it was time to unmold and cut into bars. 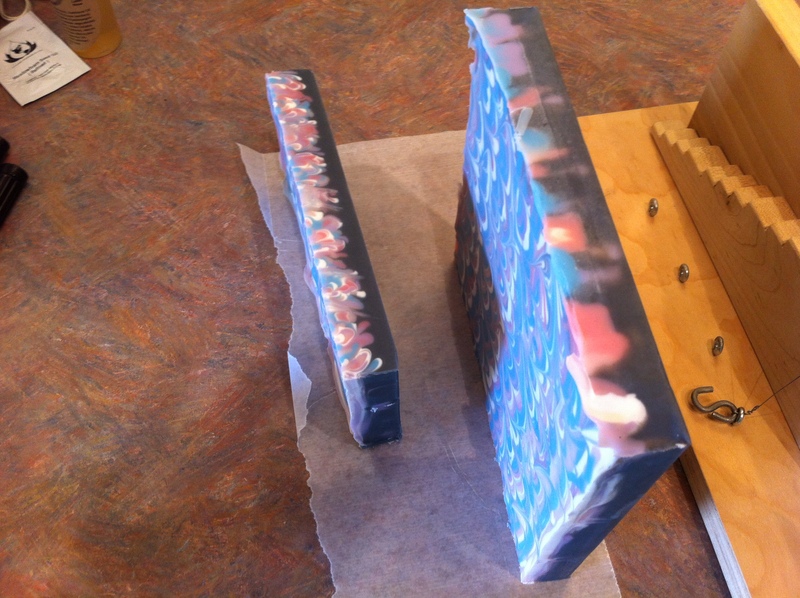 Soaps made in slab molds require a different method of cutting, so out came my adjustable log-splitter. The first cut split the slab lengthwise into smaller slabs, the log-splitter was adjusted for the next cut, and the smaller slabs were sliced widthwise to create the finished bars. 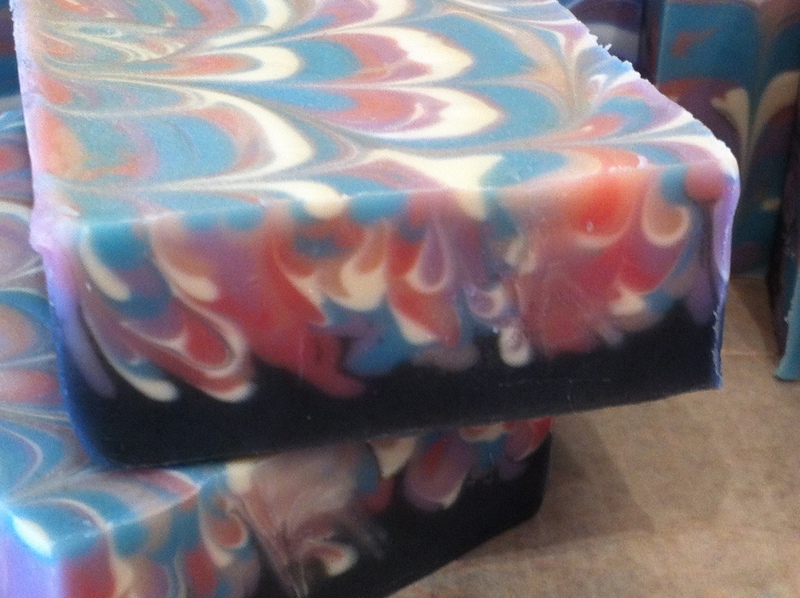 I decided to name this soap “Aurora.” My intent was create a soap reminiscent of the Northern Lights (or Southern Lights for our down-under friends). In that regard, I failed because my colors weren’t vibrant enough. The aroma hits the mark, though, because it’s zingy and refreshing. And, truth be known, I like the design on the side of the soap better than the peacock swirl. Next time I use this technique, I might just cut it differently to accentuate that part! Aurora is on the curing rack and will be listed in my Etsy shop around the middle of July. This entry was posted in Artisan Soap, Essential Oils, soap challenge, soapmaking, Soapmaking Techniques, Whipped Body Butters and tagged artisan soap, colorants, essential oil, homemade tools, peacock swirl, soap, soap challenge club, tutorial by blossomandtwig. Bookmark the permalink. I like it so much,Shari! I especially like you made a thick layer of your coloured portions, so it looks like swirled inside. Much more interesting than leaving it plain. 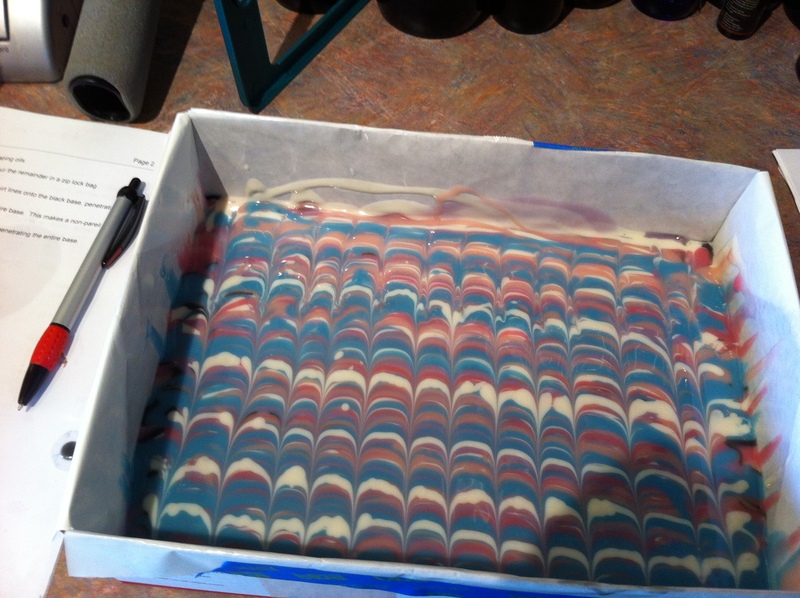 Love the colors and swirl pattern! Yes, even the sides look great! 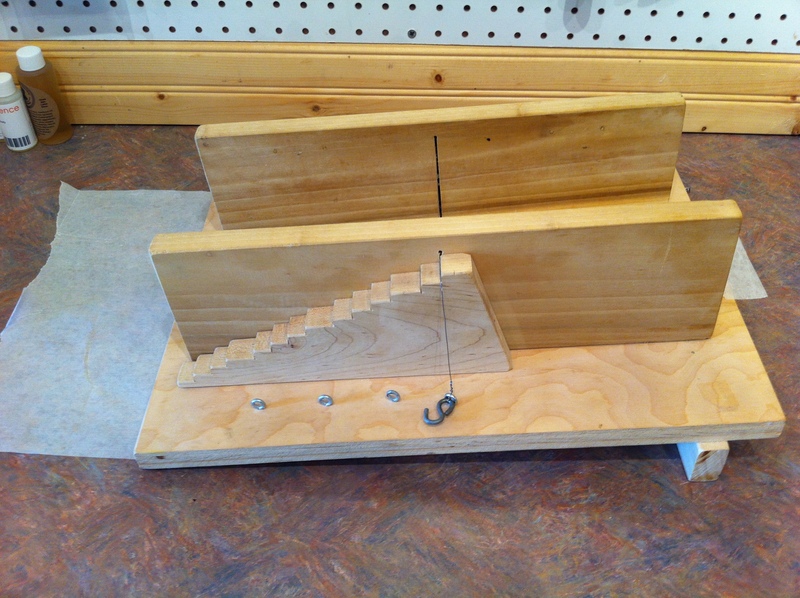 Totally jealous of your log splitter…great job, Shari! Thanks Amy! I really do like the sides – the design reminds me of raindrops. The log-splitter isn’t used too often, but it’s great to have for projects like this! I luv the black base… It looks great with the colours you chose! Great job! Beautiful! The colors are great, and I bet your soaping area smelled so good while it was curing! I love minty soaps! Thanks so much, Chrissy! I like the colors, too, they just weren’t what I had planned (but that’s the way it goes sometimes). 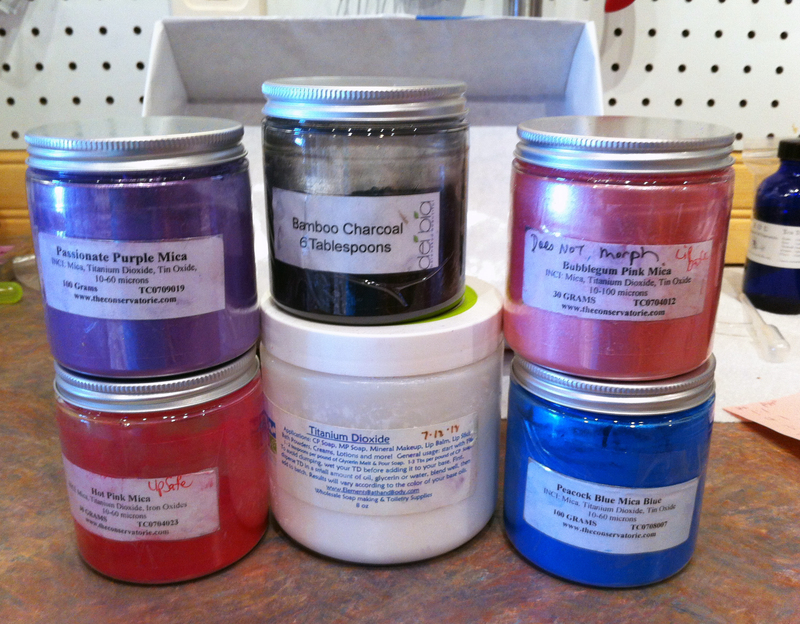 Yes, my workshop smelled GREAT while I was making it and while it was curing! This peppermint eo is especially nice – smooth and sweet! Very beautiful! The colours are lovely ! Beautiful, Shari! 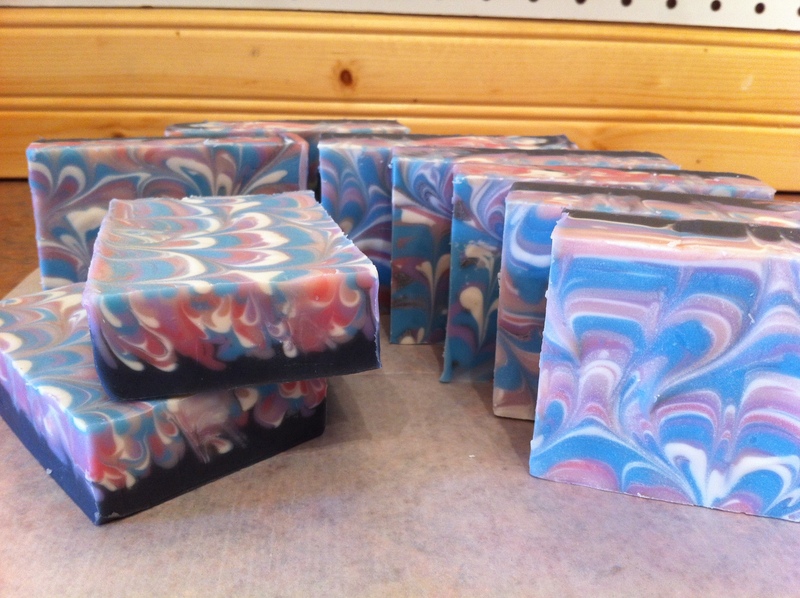 I love the colors, and peppermint and tea tree is a lovely combo. Best wishes with the soap challenge club! Thank you, Jenny! I’ve never tried those two essential oils together before, but it smells very nice. Sometimes it pays to try new things. That’s why I like the soap challenges! 🙂 Even if I don’t win, it gives me a chance to step outside my comfort zone a little bit! Thanks so much! Honestly, it’s not that hard to do, there’s just a lot of step involved. Hang in there with the swirls. Not all of mine turn out right either!